Do you have a permanent damp spot in your yard? Do you always get water in your basement after a heavy rain? A simple solution might help dry things up. Here are the basics. Things with “French” in the title are usually fancy, right? Poodles, perfume, pastries. 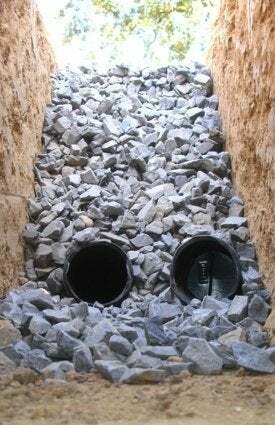 But a French drain is nothing more than a ditch in the ground, inset with a perforated pipe under a layer of gravel. That pipe funnels storm water away from where you don’t want it—along the foundation, for example—and deposits that water in a more desirable place, such as the municipal storm drain or a rain barrel. It sounds elegant but in reality, it’s nothing more sophisticated than a gravel-lined ditch with an embedded pipe that carries water away from the home. Whereas gutters collect precipitation as it runs off the roof, French drains manage water at ground level. Let’s say that after a rainstorm, water tends to pool in a particular low spot on your property. Rerouting the flow of water with a French drain would alleviate that problem. A French drain also provides a solution for basements that admit water through the foundation. In these “wet” basements, water presses against the foundation and gradually leaks through. With a French drain, however, water near the foundation can be rerouted and deposited elsewhere. If water continues to invade your basement despite seemingly adequate outdoor drainage, then you might need to install a French drain indoors. Installation involves cutting a trench in the basement slab along the perimeter of the foundation, laying pipe in the trench, and putting in a sump pump to move water from the interior to the exterior. Whether installed in the yard or the basement, a French drain works on the same principle. First, a trench is dug with a slope in the direction you want the water to go; a slope of one inch for every eight feet in length is generally recommended. To determine the correct angle, use a level string tied between stakes, then measure the distance from that reference point to the trench bottom. Because there is a direct relationship between the diameter of a drain pipe and its relative effectiveness, make your trench no smaller than 12 inches wide, and aim for a depth between 18 and 24 inches. If you’re installing a French drain around your foundation to prevent basement moisture, take care to position the pipe below slab or finished floor level. After digging your trench, fill it with a few inches of crushed stone. 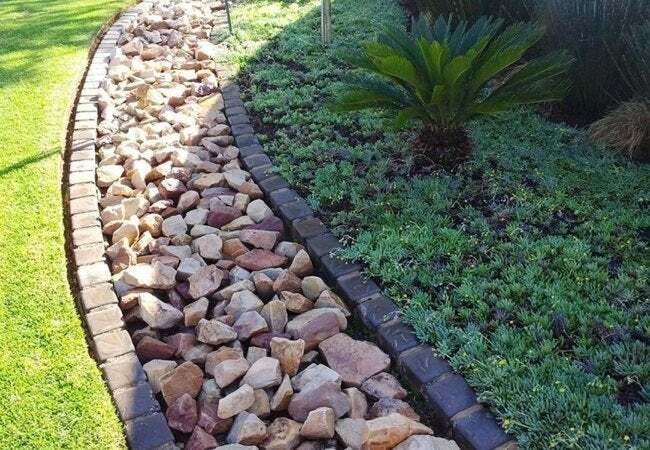 Cover the stone with water-permeable landscaping fabric to discourage weed growth. Next, lay piping into the trench. Choose one of two types, either rigid PVC with predrilled holes or flexible drain pipe cut with slits. PVC lasts longer, and if you encounter a clog, it can be cleaned with pressure or a plumber’s snake. Flexible pipe, on the other hand, is less expensive and easier to work with. Opting for PVC? You can attach a 45-degree angle joint to the start of your pipeline and then connect the joint to a pipe that can be left sticking out of the ground for an easy-access clean-out point. Another important thing to remember in PVC installations: Orient the pipe holes downward. Counterintuitive though it may be, French drains work by allowing water to flow into them from below. Wrap landscaping fabric around the pipe to keep dirt and roots from obstructing the system. Finally, infill the trench with gravel to grade. Alternatively, infill with gravel to a point a few inches below grade, then add dirt to span the remaining distance. Although covering the pipe complicates future maintenance efforts, doing so allows the French drain to be completely concealed. Instead of wrapping pipe with landscaping fabric, you can buy a flexible perforated pipe that comes encased in water-permeable fabric. If you are planning to dig a long trench, think about renting a trench digger to make quicker work of it. Place a catchment barrel at the terminus of your drain as a way of harvesting rainwater for use in the garden. After trenching, expect to have a large quantity of loose dirt in need of a home. Before you begin the project, decide what you will do with the dirt.